Фирдауса Наилевна ХАЗИПОВА родилась в г.Уфе. Училась в Уфимском училище искусств. Окончила филфак Башкирского государственного педагогического института. Работала художественным руководителем в нефтяном институте, главным редактором газет и журнала в нефтеперерабатывающей и строительной отраслях. Лауреат всероссийских журналистских конкурсов «За экономическое возрождение России», «Лучшая публикация по проблемам ТЭК России», международного конкурса «Не москвичи – о Москве», Всероссийского профессионального журналистского конкурса в номинациях «Лучший журналист корпоративной прессы -2011 и 2013 гг.». Автор публицистических книг: «Среди роз и бензина», «Опасный невидимка», «И школьный вальс опять звучит…», «70 лет по пути созидания», «Здесь начинается мир будущего». Имеет звание «Заслуженный работник печати и массовой информации Республики Башкортостан». Член Союза журналистов России и РБ и Интернационального союза писателей. Финалист литературного конкурса «Автор года-2015», участник программы «Новые имена» (2015 г. ), номинант на премию «Писатель года-2016 и 2017 гг.», дипломант литературного конкурса имени О’ Генри (2017 г.). Firdausa KHAZIPOVA was born in the city of Ufa. 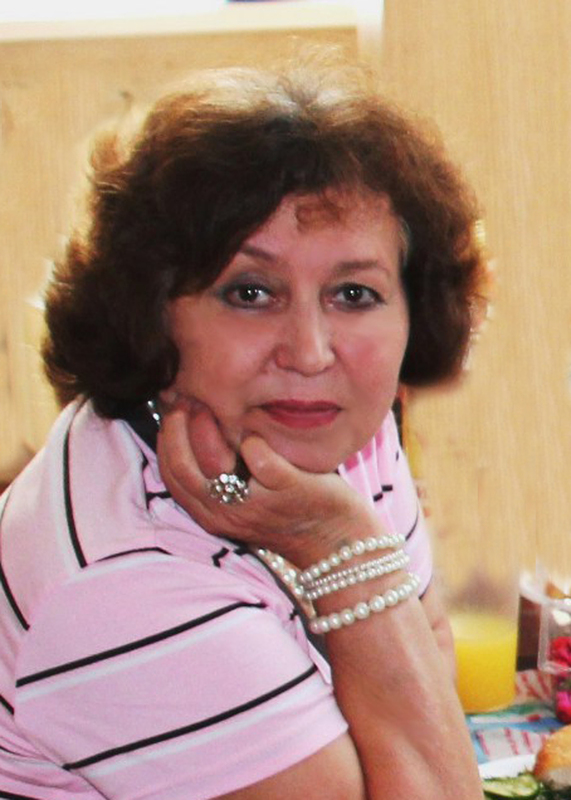 A graduate of the Bashkortostan State Pedagogical University, she is currently working as the chief editor of a newspaper. Firdausa is the winner of numerous journalism contests. She is a member of the Journalists’ Union of Russia and Belarus and a candidate member of the International Union of Writers. Has the title of “Honored worker of press and mass media of the Republic of Bashkortostan”. Having authored several non-fiction books, Firdausa became a finalist in the “Author of the year 2015” literary contest. She has also taken part in the “New names” program (2016, 2017). The year this story occurred, the whole Cis-Urals region was gripped by a chill of the likes it’d never seen before. The trees, the electrical wires, the benches in the parks – everything was covered with white, fluffy blankets of hoarfrost. Life became hard for the birds, the animals and even the million or so humans living in the Urals’ largest city. “U-u-u-uh,” howled the biting, snow-white winds. “U-u-u-uh,” tried to imitate them the little Frostlings, soaring upwards from the snow banks. The whole snow-borne gang was frolicking at large in the forest: now snaking with the wind close to the ground, now swirling around the trees in a powdery whirlwind. And, all that time, the Frostlings kept laughing in their incredibly high voices – like thousands of little bells, ringing in the thicket. Long ribbons of snow flew down from the ice-clad tree branches, assuming strange shapes. – Twotsies, come to me! – shouted one of the tutoresses in a ringing voice, while constantly changing her appearance. Everything came in motion. The older Frostlings immediately rushed to her side. – Onesies, come over here! – creaked the other tutoress, and the bark of a nearby tree formed a fissure. Feeling somewhat confused and even scared, the onesie (whose name was Frosty) scurried in the direction of his brethren. The gentle blue of the dusk was already beginning to flow down from heavens, as the Frostlings, headed by the Chill Hag, flew out for their first practice lesson. Far ahead gleamed the lights of a large city, full of people, cars and buildings. Mixed with timidity before the unknown, elation and a sense of joyful wonderment were growing inside Frosty. He felt full of kindness and a desire to embrace this cold, shining, moonlit world. The Chill Hag kept changing her shape – crumbling into tiny flakes; coiling into a creaking snowball; turning invisible and making itself felt with stinging touches. And, all the time, the elongated polygons of her glacial eyes followed her charges diligently. And now, looking at Frosty, she felt hostile envy at the sight of his naive delight. The rest of the Frostlings were true children of the Iciness and the gripping Frost: indifferent, wicked and cruel. Reflected in their bulbous eyes, the world seemed ugly and distorted. They flew over a tram, making it’s jangling journey along the city’s outskirts. Some of the mischievous Frostlings darted to the nearby park and started shaking tree branches, filling the air with clouds of icy dust. Others quickly smeared all the metal doorhandles in the city with chilly glue. The cold air was teeming with prickly icicles. Crackling fervently, gangs of Frostlings rushed at people, eager to take away the warmth they were carrying. The Chill Hag rubbed her hands contentedly – this year’s onesies looked lively and definitely showed promise. Only Frosty was keeping away from these heartless games. Clinging to a tree branch, he was looking with sympathy at the humans, who shuffled from foot to foot, shrinking their heads into the raised collars. – Oh, why all this anger and cruelty? – he thought. None of this escaped the Chill Hag’s attention. She felt more and more irritated by how different Frosty looked from the rest! Like a vicious Fury, she corkscrewed herself into Frosty. There was a loud crackling. Sparks showered from Frosty’s eyes. He crumbled into a hundred prickles that filled the air, and every one of them was burning and screaming in pain. And then, he seemingly turned to stone. Feeling total indifference towards everything around him, he drew his prickles back in, assuming the form of an uneven circle. Staring out of the center of this circle were his cold, passionless eyes. Седой Мороз и Стужа с небольшой свитой снегоколючек отстали от облаков в районе Уральских гор и приземлились рядом с большим водопадом недалеко от резиденции Большой Капли. Они приблизились к гроту, из которого низвергался веселый водопад. Мороз повел руками в стороны, и капли воды застыли в полете. Стужа дохнула. Все, что было вокруг мокрого, превратилось в застывшие кристаллики льда. Заклубилась морозная дымка. Вокруг входа в грот вырос ледяной занавес с бахромой из сосулек разной длины и курчавости. Даже Мороз залюбовался сказочным дворцом, в недрах которого, казалось, вот-вот зазвучат самые красивые органные мелодии. Но музыки не было. Он вошел в грот и деликатно остановился у входа, чтобы ненароком не заморозить обитателей. Посреди грота лежало ярко-голубое озеро, внутри которого беззвучно переливались огоньки. Вот оно поднялось с земли и оказалось Большой Каплей. Она все росла и уже поднялась до потолка. Мороз тряхнул головой, и вылетевшие снежинки, как на дрожжах, приподняли Седого Мороза до потолка.